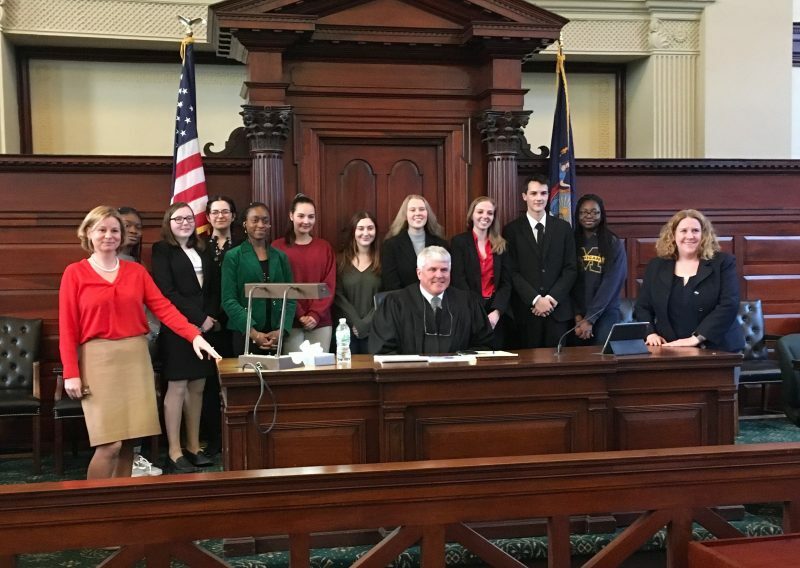 This year Rensselaer County had seven area high schools competing: Catholic Central High School, Columbia High School, The Doane Stuart School, Emma Willard School, Hudson Valley Homeschool, Lansingburgh and La Salle Institute. Co-Coordinators Jessica B. Mocerine, Esq. and Jennifer C. Shatz, Esq., wish to express their gratitude to those who served as judges: Supreme Court Justice Richard J. McNally, Jr., County Court Judge Jennifer Sober, Family Court Judge Elizabeth Walsh, Town Justice George Burke, James Caruso, Esq., Kelly Cramer, Esq., Linda Johnson, Esq., Keith Muse, Esq., Kyle Petit, Esq., and Jacob Sher, Esq. Thank you to the following attorneys who served as legal advisors to some of the participating schools: Frederick Brodie, Esq., Cynthia LaClair, Esq., and Timothy Tippins, Esq. A special thanks to the Honorable Richard J. McNally, Jr., for judging our finals held on March 12, 2019, between Doane Stuart and Hudson Valley Homeschool. The Doane Stuart School was our County Champion and will move on to the Regionals to be held on April 27, 2019, in Albany County. Also thank you to Richard Reilly, Chief Clerk of the Rensselaer County Courthouse and courthouse staff for all of their assistance during the tournament.